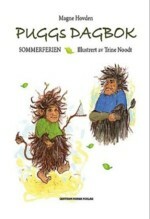 Children’s book, published by Centrum Forlag in Norway, November 2009. Aired as a radioplay several times on national radio in Norway (P4). Several more spin-off radio plays has been aired since. Movie rights sold. SCARE, WHACK AND BARBEQUE! Pugg’s Diary is a humorous take on the life of trolls, from the perspective of one young troll’s summer holiday diary. It stretches from June 15th to August 14th.